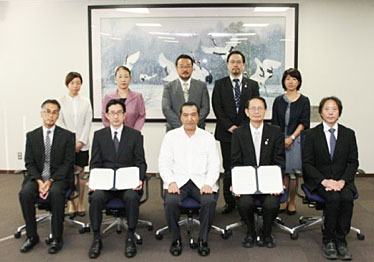 The Japan International Cooperation Agency (JICA) and the Nippon Sport Science University (NSU) in Tokyo concluded a Memorandum of Understanding (MOU) on August 6, 2014 which is designed to expand JICA’s ongoing program of sending young sport volunteers overseas. The MOU includes sending baseball coaches to Brazil and athletic instructors to Cambodia. JICA is reported to be in discussion with Kinki University in Osaka to send baseball coaches to Peru. These are a part of a program by the Japanese Government, “Sports for Tomorrow (SFT)”, to promote Sport and the Olympic Movement by sending coaches abroad, providing sports equipment, improving sports facilities and sending teams of experts to support the expansion of sports education. NSU has rich human resources and knowledge of athletic education as well as network, and produced over 360 JICA volunteers, including 28 students in Cambodia, Mordive, Morocco and Brazil in fiscal 2013. In recognition of extraordinary contribution to help promoting baseball and softball on a global basis over the years, IBAF at its Congress in Tokyo on April 14, 2013 presented Special Award to the JICA.